From the top of the Willis Tower you can capture the immense landscape surrounding Chicago and the greater Chicago land area. Chicago has a history of building the world's tallest buildings. But the height of a building is not the only thing which determines is character. Even on this windy Chicago day, December 21st, we see a glimpse of Willis tier from the ground. Rather than looking to the sky to enjoy this massively tall building, we look at the flag display showcasing the identity of Chicago. 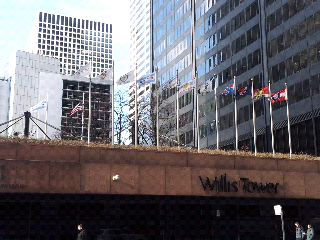 Willis Tower uses flags to honor and represent the state, departments, city, and teams.